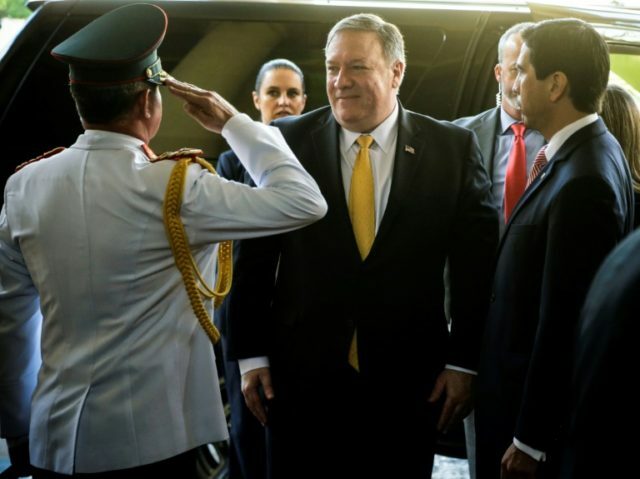 During a visit to the Colombian town of Cucutá this weekend, Pompeo once again pleaded with the Venezuelan regime to allow the safe passage of aid into the country, as it struggles with the most severe humanitarian crisis in its recent history. Responding to the call, Maduro’s Foreign Minister Jorge Arreaza admitted that Venezuelans were experiencing an “unimaginable” level of suffering, but instead blamed it on a supposed “criminal blockade” imposed by the United States. The blockade allegedly exists in the form of economic sanctions aimed at squeezing the regime’s financial revenues and state-run industries. Pressing the Maduro regime to allow the passage of humanitarian aid has become the forefront of the Trump administration’s recent efforts in the region, with the U.S. the leading contributor of a $100 million aid package sent to Colombia back in February. However, efforts have so far been unable to reach the thousands of Venezuelans in urgent need of humanitarian assistance, mainly because the military followed orders to block its passage into the country, even placing tankers on the Tienditas International Bridge connecting Venezuela with Colombia. The request for aid originally came from Venezuela’s legitimate president, Juan Guaidó as part of efforts to alleviate the impact of the country’s humanitarian crisis. Millions of people in the country are malnourished, without electricity, and unable to access essential medical supplies. The Maduro regime has repeatedly tried to save face by denying the existence of any crisis, caused in large part due to nearly two decades of radical socialist governance.